Thanks for telling us a bit about your note! Once we get the email we’ll dive into it, and we’ll give you a call within 24 hours so we can get any final bits of information on the note we need so we can make you a FAIR ALL-CASH OFFER based on your goals this week. Our company is a real estate investment firm and note buying firm, and we focus on helping provide solutions for home owners and note owners. We have been buying mortgage notes since 1989! Nothing. There are no fees or commissions. 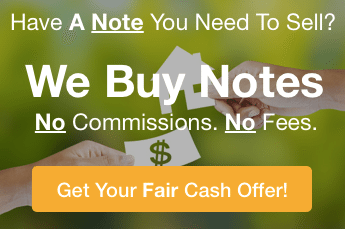 We don’t list your note… we’re looking to actually buy your note ourselves. First, we’ll give you a call to get a few more details about your note. Just basic stuff, nothing fancy or complicated. Just enough info for us to know what we’re dealing with so we can make you a fair and fast all-cash offer. Next, if you’re ready to have us buy your note based on our offer, we’ll get the paperwork going with a local trusted third party facilitator to help with the admin of the note payments sale. Last, (usually within a few weeks) you’ll have the cash in your hand so you can move on… and you’ll have cash in hand rather than having to wait for years and years to collect your note payments. What If The Private Mortgage Note Isn’t Performing? Will You Still Buy It? We buy notes in that are performing… and also notes that aren’t performing. You’d be amazed at some of the notes we’ve purchased before. Why do we buy even non-performing notes? Simple, often times we’re able to turn a bad situation into a great situation. Of course a note that isn’t performing or has a troubled borrower is a higher risk for us which leads to a lower offer price. But often times we’ve been able turn around a note and make it performing again. Either way, we look forward to talking with you! – The American Funding Group Team!